Unfortunately, tablets and computers change so quickly that printed information can become outdated very quickly.... This must be taken into mind when reading this book! There are a lot of helpful tips for new users, like myself, but it only goes so far as things have changed since this book was written! 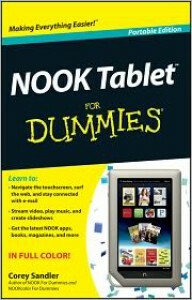 I very recently got a Nook and LOVE it! It is my very first e-reader of any type and it is definitely going to be increasing the number of books that I read. When I first got it, it did take a while to get used to as things do run a little differently than on a computer. These tablets are amazing and with their recent addition of the Google Play store, you are able to turn your Nook into a fully functioning tablet, great for all media, games, etc! One thing that the Nook is missing that the Kindle has is a camera. Not a big deal for me, considering the price difference! Anyway, this is NOT a review of my Nook, but rather a book review! lol! Even though some things have changed since publication, it still is worth picking up for anyone who is brand new to e-readers or tablets in general. I was able to pick up a lot by just playing around myself, but there definitely are tips that I did not know.